The Center for Data Innovation spoke with Dr. Louis Rosenberg, CEO Of Unanimous AI, an AI company based in San Francisco. Rosenberg discussed how AI can be used to leverage swarm intelligence. Joshua New: Can you describe how Unanimous AI works? Why is swarm intelligence so well suited for this kind of work? Louis Rosenberg: At Unanimous AI, we turn groups of people into artificial experts by combining their knowledge, wisdom, insight, and intuition using AI algorithms. The technology we use is called Swarm AI because it’s modeled on how swarms in nature amplify the intelligence of populations. We currently build artificial experts using Swarm AI for a wide range of uses, from accurately predicting the outcome of sporting events and political elections, to helping large corporations predict the impact of new marketing messages, ad campaigns, and product features. The reason why birds flock, fish school, and bees swarm is that they are significantly smarter together than the individuals could be on their own. Biologists call this “swarm intelligence.” At Unanimous AI we have enabled human groups to form similar systems online, modeled after natural swarms but using AI algorithms to connect groups together over the internet. The results are remarkable, enabling groups to amplify their predictive accuracy by 130 percent in rigorous long-term studies. We believe this is only the beginning, as this technological direction has the potential for much greater intelligence amplifications. New: In 2017 Unanimous AI correctly predicted the final score of the Super Bowl. Was there any luck involved in this, or can your approach regularly predict these kind of difficult-to-predict outcomes? Rosenberg: There is always luck involved when it comes to sports predictions—both good luck and bad luck. That’s because all sporting events have uncertainty, where unexpected events can happen at any moment. This means it’s impossible to assess the performance of a prediction technology on a single game like the Super Bowl. Instead, you need to assess performance across a large set of games so that the results are statistically significant. That’s what we recently did in a paper published as a collaboration between researchers at Unanimous AI and Oxford University. In this paper, we had groups of people predict the outcome of 50 consecutive soccer games over five straight weeks in the English Premier League. Results showed that when working as individuals, the participants in the study were 55 percent accurate in forecasting the outcome of the games: win, lose, or tie. When connected together as a Swarm AI system, these same individuals were 72 percent accurate when predicting the same 50 games. That’s a very significant amplification of intelligence. New: You wrote a paper describing how swarm intelligence can actually improve how humans respond to moral dilemmas, which is surprising considering how group dynamics often result in “tragedy of the commons” problems. How did you discover this? Rosenberg: In layman’s terms, what we do at Unanimous AI is build “hive minds.” In the world of science fiction, the notion of a hive mind often has negative connotations, implying a group that has lost the moral sensibilities of individual people. The Borg in Star Trek is a great example of this. Because of these sci-fi visions, we were very curious to know if building a hive mind using Swarm AI technology would have a negative impact on moral decisions, so we started conducting formal studies. One study explored the ability of groups to overcome a common moral dilemma known as the Tragedy of the Commons. We compared groups making decisions using a traditional vote, versus groups making decisions as an artificial swarm intelligence. We found that artificial swarms reached moral decisions more often than the vote. This was a big surprise to us, but a very positive one. More recently we’ve been conducting deeper studies, exploring how well groups can reach socially optimal decisions. We found that swarms enable groups to reach decisions that are best for the population as a whole at significantly higher rather than traditional voting methods. New: Can you describe how well this approach works for predictions about financial markets? Rosenberg: When it comes to predicting financial markets, researchers at Unanimous AI and Oxford University has recently finished a three month study where we had groups of day-traders predict the weekly motion of four key financial indicators: the S&P 500 (SPX), the price of gold (GLD), the price of gold miners (GDX), and the price of oil (CRUDE). We found that by thinking together as a Swarm Intelligence, the financial traders were able to amplify their collective accuracy by 26 percent with high statistical significance. 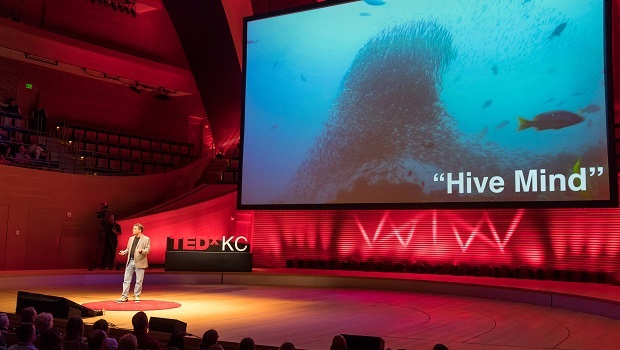 New: You gave a TED Talk about how swarm intelligence could help protect against potential dangers of artificial intelligence. Could you walk me through this? Rosenberg: Yes, this past summer I gave a TED Talk about the power of artificial swarm intelligence and why I believe it’s a much safer path toward building a “super-intelligence” than traditional methods being worked on by researchers. My reason is simple—when we use Swarm AI technology to create an artificial super-expert, we leverage the power of AI technology, but we keep humans in the loop, ensuring that human values, morals, sensibilities, and interests are inherent in the overall system. This is a safer approach than building a super-intelligent AI system that is based entirely on software algorithms, as we have no reason to believe that such an AI would share our values or our interests. Such an AI system, if it became self aware, could easily be as foreign to us as an alien arriving from space. And if it does not share our interests, it could easily become a threat to our existence.